The objective of this study was to explore demographic and economic characteristics associated with household food security of 2,784 low-income households with pre-school aged children receiving food supplements from the Colombian Plan for Improving Food and Nutrition in Antioquia -MANA (Mejoramiento Alimentario y Nutricional de Antioquia) in the Department of Antioquia, Colombia. Included in the study was a 12-item household food security survey was collected from a cross-sectional, stratified random sample of MANA participants in which households were characterized as food secure, mildly food insecure, moderately food insecure, and severely food insecure. It was hypothesized that household food security status would be strongly associated with demographic characteristics, food expenditure variables, and food supplement consumption by children in MANA. Food insecure households were characterized by more members, older parents, and lower income (p<0.0001). Rural residence and female head of households had higher rates of food insecurity (p<0.01). Food insecure households had the lowest monthly expenditures food (p<0.0001). Severely food insecure households saved the highest percentage of per capita food expenditure from consuming MANA supplements (p<0.0001), similarly, MANA food supplement intakes were greatest in households reporting the most food insecurity (p<0.001). The results of this study are important to describe characteristics of the population benefiting from the MANA nutrition intervention by their unique level of household food security status. Key words: Food security, Colombia, food assistance. El objeto de este estudio fue explorar la asociación de la inseguridad alimentaria en el hogar con las características demográficas, el gasto alimentario del hogar y el consumo del complemento alimentario de 2,784 hogares de bajos ingresos con niños preescolares que recibían el complemento alimentario de MANA (Programa de Mejoramiento Alimentario y Nutricional de Antioquia) en el Departamento de Antioquia, Colombia. En los hogares seleccionados mediante un muestreo probabilístico, se aplicó una escala de seguridad alimentaria compuesta por 12 ítems. Los hogares fueron clasificados como seguros, y con inseguridad alimentaria leve, moderada o severa. Se hipotecaron que el estado de seguridad alimentaria seria asociado de una manera fuerte con las características demográficas, el gastos alimentarias, y el consumo del complemento por los niños participantes en MANA. Los hogares con inseguridad alimentaria estaban compuestos por un mayor número de personas, los padres eran de mayor edad, y tenían menores ingresos y menor gasto alimentario (p<0.0001). Los hogares del área rural y encabezados por mujeres presentaron mayores porcentajes de inseguridad alimentaria (p<0.01). Los hogares con inseguridad alimentaria severa presentaron el porcentaje más alto de gasto alimentario (p<0.0001), de la misma manera, el consumo del complemento de MANA fue más alto en los hogares que reportaron inseguridad severa (p<0.001). Los resultados son importantes para describir las características de la población que se beneficie de la intervención nutricional de MANA por su nivel de seguridad alimentaria en el hogar. Palabras clave: Seguridad alimentaria, Colombia, asistencia alimentaria. Food security is defined as the access by all people at all times to enough food, acquired by socially acceptable means, for an active and healthy lifestyle (1). Conversely, food insecurity consists of situations that range from the concern over obtaining sufficient amounts of food to coping mechanisms in which the quality and quantity of food consumed are compromised. Worldwide, due to various social, economic and environmental disparities, over 850 million people face food insecurity on a regular basis (2). At the 1996 World Food Summit in Rome, world leaders set a goal to reduce the number of hungry people by half by the year 2015 (3). To meet this goal, governmental and nonprofit agencies across many regions of the world have joined forces to develop programs to reduce food insecurity in high risk populations. In Colombia, the governmental Plan for Improving Food and Nutrition in Antioquia - Mejoramiento Alimentario y Nutricional de Antioquia (MANA), was established in 2002 as a nutrition intervention targeting lowincome households (4). A critical component of MANA lies in the distribution of food supplements to pre-school aged children, which include enriched and fortified powdered milk, fortified crackers, and the vegetable-based, enriched flour Bienestarina. In 2006, the first extensive evaluation of the MANA food supplement component was spearheaded by Colombian researchers to determine the current nutritional status and estimate the levels of food insecurity of program participants (5). To accurately monitor and evaluate the impact of MANA in food insecurity, valid measures are critical. This paper addresses the validity of a locally adapted household food security scale in the MANA targeted population. The measurement of food insecurity allows governmental and development agencies to estimate the prevalence of this phenomenon, better target high risk populations and monitor and evaluate the impact of their programs at the household level (6). At least three measures have been broadly used to assess food insecurity in the developing world, including national levels of dietary energy supply, individual food intake reports, and anthropometry, which are considered costly and time consuming (7). One additional metric of food insecurity consists of subjective measures such as psychometric questionnaires that fill these gaps and accurately capture and quantify the experiences of food insecurity at the household level, while remaining inexpensive, easy to use and applicable to diverse populations (8). These psychometric questionnaires, specific to household food insecurity experiences, evolved over the course of 20 years (9). One of the first modules developed for the Community Childhood Hunger Identification Project was based on the Massachusetts Nutrition Survey (1983) that defined hunger as food insufficiency resulting from a lack of resources (10). Later, Lorenzana translated this instrument into Spanish, modified the format and validated it with poor periurban households in Venezuela (11). In 2003-2004, researchers in Antioquia, Colombia, conducted a regional study using the adapted Lorenzana tool (Colombia Household Food Security Survey-CHFSS; 12). This 12-item survey consists of a range of questions about adult, child and household food insecurity experiences (13). The results of several studies in Colombia have confirmed the appropriateness of household food security tools to determine food insecurity levels of households in Colombia (12, 13). Because of Alvarez’s work, the CHFSS was included in the 2006 MANA evaluation protocol; thus, the data from the MANA assessment were used in this study to assess factors that predict food security (5). This study builds on previous knowledge generated by demonstrating the usefulness of locally adapted household food security scales when applied to low-income households with pre-school age children receiving government food assistance, with implications for policy makers and program officials concerned with programs aiming to reduce levels of food insecurity in the developing world. Data were collected from a cross-sectional, stratified random sample representative of the 200,000 pre-school age MANA supplement recipients. Participating communities were randomly selected from 36 regions in the department of Antioquia, Colombia.Within each community, children were randomly selected from local MANA program. Sample size was calculated by Colombian researchers using Epitat® software. A maximal regional error of 0.05% resulted in a sample of 2,784 low-income households with pre-school children. The ethics committee at The University of Antioquia approved data collection with informed consent collected once the purpose of the study, dispersion of data, participant rights and risks were explained prior to participation. The analysis of the resulting database was approved by the Institutional Review Board at The Ohio State University. Trained interviewers administered semi-structured faceto-face questionnaires to child caregivers at community centers. The questionnaires included the following items: the CHFSS; length of participation in MANA; consumption of MANA powdered milk packets (25 gm each); MANA crackers (30 gm each); and Bienestarina. Demographic variables consisted of area of residence (urban/rural), housing characteristics, age of parents and participating child, household size, number of siblings of participating child, and previous month’s income. The estimated monetary savings from receiving the food supplement and monthly household food expenditures were also reported. Based on these two variables and the size of the household, we calculated the proportion of per capita savings with regards to per capita food expenditures. The household food security questionnaire consisted of twelve questions concerning the experiences of food insecurity as a result of financial constraint. Each item was followed by a frequency of occurrence question, which assessed how often a given condition occurred. A negative response to the initial item was scored as “0”, and the follow up questions were scored as rarely = “1”, sometimes = “2” and always = “3”. The resulting summative food security score ranged from zero to thirty six; representing the most and least food secure, respectively. Based on the raw score, household food security status was categorized using the following cut-off points as used by Latin American researchers (14): 1) Food secure (0 points); 2) mildly food insecure (1-17 points); 3) moderately food insecure (18-26 points); and 4) severe food insecurity (27-36 points). Caregivers that responded negatively to the first item were not asked the remaining questions in the food security questionnaire. ANOVA and X2 tests were used to examine differences in sociodemographic variables, supplement consumption and participation in MANA across the four levels of food security status. The differences between the categorical food security status variable and household food expenditure was examined using a multiple ANOVA model that included the following covariates: area of residency, gender of head of household, mothers age, previous month’s income, indoor plumbing, participation in other assistance programs, involvement in Prolonged Aid and Recovery Operation (OPSR) for refugees, household size, number of places to sleep, fathers education, number of children in MANA, packets of milk, packets of crackers, grams of Bienestarina, residency in high risk area, and in-kind payment for work. When significant differences (p<0.05) existed among food security categories, specific differences in the mean values were examined using post hoc tests with Bonferroni adjustments for multiple comparisons. Descriptive, bivariate ANOVA and multiple ANOVA analyses were conducted using STATA for Windows (version 8.2, StataCorp, College Station, TX). Over 50 percent of mothers and fathers partially or entirely completed elementary education (mothers 54.6%; fathers 58.7%; Table 1). Approximately one third of the parents partially or entirely completed their high school education (mothers 37.9%; fathers 27.6%). The majority of women were housewives (78.6%). Households headed by women were 18.9% of the sample and the mean household size was 5.7 individuals. Most households had electricity (86.2%), indoor plumbing (80.5%) and sewage (59.2%). Over half (54.5%) of the households were landowners and 41.6% cultivated and consumed the food and animals they produced. One fifth of the population lived in high risk environmental disaster areas, and 8.1% of the children were refugees. No significant differences were evident in food security between female and male children (p=0.83). Food insecure households were significantly more likely to be located in rural areas, have female heads of household, consist of parents who were older, include larger households with more siblings and fewer places to sleep (Table 2). a,b,c superscripts denote statistically significant differences between food security status categories using post hoc tests with Bonferroni adjustments for multiple comparisons p < 0.05. Most households were categorized as food secure (48.2%, n=1,343) or mildly food insecure (37.9%, n=1,056). One-tenth (n=280) of the sample were categorized as moderately food insecure households and 3.8% (n=105) exhibited severe food insecurity. In multiple ANOVA models, significant differences in food expenditures were maintained after adjusting for several covariates. The previous month’s income and amount of money spent on food was significantly lower in severely food insecure households (Table 3). Correspondingly, mean income was significantly lower in individuals with decreased food security status (p<0.0001). Although the food secure households spent more money on food than the food insecure households, the proportion of income spent on food was lowest in the food secure group. Additionally, the proportion of per capita savings on food expenditures by consuming the MANA supplements was significantly higher among food insecure households. * Means are reported in US$. ‡ Multiple ANOVA adjusted by area of residency, gender of head of household, mothers age, previous month’s income, indoor plumbing, participation in other assistance programs, involvement in Prolonged Aid and Recovery Operation (OPSR) for refugees, household size, number of places to sleep, fathers education, number of children in MANA, packets of milk, packets of crackers, grams of Bienestarina, residency in high risk area, and in-kind payment for work. 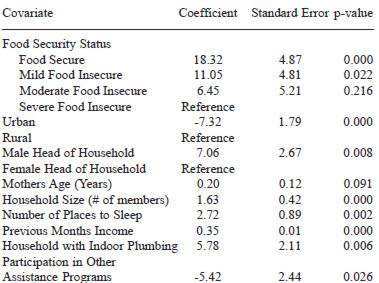 Significant predictors of household food expenditures included food security statuses, areas of residency, genders of head of household, household sizes, numbers of places to sleep, incomes of the previous month, indoor plumbing facilities and participation in other assistance programs (Table 4). The ANOVA model accounted for 52% of variance in food security status. *Adjusted additionally by fathers education, number of children in MANA, packets of milk, packets of crackers, grams of Bienestarina, participation in Prolonged Aid and Recovery Operation (OPSR) for refugees, in-kind payment for work and residency in high risk area. ‡ Coefficients are reported in US$. 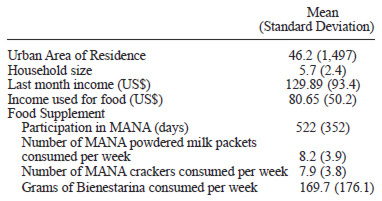 The length of time that the child participated in the MANA program did not differ by food security status, but child food supplement consumption did (Table 3). The number of siblings participating in MANA was higher across all levels of food insecurity. The purpose of this study was to explore factors associated with household food insecurity of MANA participants in Antioquia, Colombia. An unexpected outcome of this work included differences in food supplement consumption by level of household food security status. Additional research evaluating more comprehensibly the diet of the children and its correlation to food security status would be important to further understand how households cope with food insecurity. Socioeconomic indicators and food security status were strongly correlated within this population. Even among the lowest socioeconomic strata in Colombia, where over 60% of income is used to purchase food, food expenditure significantly differed by food security status. Similar reductions in daily per capita food expenditures by food security status were also found in convenience samples taken in Bolivia, Burkina Faso and the Philippines (15). Researchers in these countries found variation in purchase patterns of specific food groups by food security status. A limitation of our work is that data related to expenditures on specific food groups were not available. This additional information may be useful to understand the financial coping mechanisms specific to food expenditure incorporated in Colombia when households experience various levels of food insecurity. MANA participants reported approximately a ten percent higher prevalence in food insecurity than nationally representative samples of Colombian households (16). This result was expected because self-selected food assistance participants typically have higher levels of food insecurity than non-participants (17). The high prevalence of food insecurity in the MANA population is consistent with research done in Los Angeles County that demonstrated that levels of food insecurity were higher in households receiving public assistance (18). Households with evidence of hunger in Massachusetts reported participation in more food assistance programs than their non-hungry counterparts (19). Specifically, the hungry households were more likely to participate in the US Food Stamp Program, nongovernmental community-based programs, and community food assistance programs. In the Appalachian regions of Ohio, food insecurity was associated with participation in more food assistance programs, but the association was not statistically significant (17). For MANA, the higher food insecurity prevalence in program participants is relevant because it reflects how well it reaches the targeted population groups. Household educational factors were strongly associated with MANA participants’ food security status, consistent with research in other countries (14,15,20-22). Researchers in Iran found inverse associations of adult food insecurity and child hunger with father’s education and mother’s education, similar to our results (23). Research in rural Ecuador found that the mother’s educational level, but not the father’s, correlated negatively with household food insecurity level (24). In the U.S., Mexican immigrant households showed maternal education and age negatively associated with household food security levels (25). Consistent with our results, household food insecurity was inversely associated with household size in Iran (23). Large households on the US border also had higher odds of being food insecure than their smaller counterparts (26). Results from the Panel Study of Income in the US showed that food insecure women had more family members and children (27). This paper presents a description of factors associated with current food security status of households participating in a food assistance program in Colombia, showing the complex socioeconomic and demographic challenges to be confronted when addressing food insecurity in such settings. The implications of this study are critical for governmental and nongovernmental agencies interested in assess household food security status and other social-economic characteristics of populations with the goal of better targeting those to receive the benefits from nutrition and food assistance interventions. Anderson SA. Core indicators of nutritional state for difficultto-sample populations. J Nutr 1990 Nov;120 Suppl 11:1559-600. Food and Agriculture Organization of the United Nations. The state of food insecurity in the world 2006. Rome: FAO; 2006. Food and Agriculture Organization of the United Nations. Food: a fundamental human right. Rome: FAO; 1996. Gobernación de Antioquia y Universidad Católica de Oriente. Todos Participaron: Seguridad Alimentaria y Nutricional para el Desarrollo Local. Medellín, Colombia. 2004. Gobernación de Antioquia. Indicadores básicos: contexto socio demográfico, estado nutricional, de salud e ingesta dietética de los niños que participan en el programa de complementación alimentaria alianza MANA. Medellín, Colombia. 2006. Frongillo EA Jr. Validation of measures of food insecurity and hunger. J Nutr 1999 Feb;129(2S Suppl):506S-9S. Review. Smith L. The use of household expenditure surveys for the assessment of food insecurity. International Food Policy Research Institute. Washington, DC. URL: www.fao.org/DOCREP/005/Y4249E/y4249e08.htm. Accessed July 6, 2007. Coates J, Frongillo EA, Rogers BL, Webb P, Wilde PE, Houser R. Commonalities in the experience of household food insecurity across cultures: what are measures missing? J Nutr 2006 May;136(5):1438S-48S. Keenan DP, Olson C, Hersey JC, Parmer SM. Measures of food insecurity/security. J Nutr Educ. 2001;33 Suppl 1:S49-58. Wehler C, Scott R, Anderson J. The community childhood identification project: a model of domestic hungerdemonstration project in Seattle, Washington. J Nutr Educ Behav 1992;24:S29-35. Lorenzana PA, Mercado C. Measuring household food security in poor Venezuelan households. Public Health Nutr. 2002 Dec;5(6A):851-7. Alvarez MC, Estrada A, Montoya EC, Melgar-Quinonez H. Validation of a household food security scale in Antioquia, Colombia. Salud Publica Mex. 2006 Nov-Dec;48(6):474-81. Hackett M, Melgar-Quiñonez H, Alvarez MC. Internal Validity of an Adapted Household Food Security Scale is Maintained with Diverse Populations of MANA Food Supplement Participants in Antioquia, Colombia. BMC Public Health. 2008 May 23;8(1):175. Lorenzana PA, Sanjur D. Abbreviated measures of food sufficiency validly estimate the food security level of poor households: measuring household food security. J Nutr. 1999 Mar;129(3):687-92. Melgar-Quinonez HR, Zubieta AC, MkNelly B, Nteziyaremye A, Gerardo MF, Dunford C. Household food insecurity and food expenditure in Bolivia, Burkina Faso, And the Philippines. Nutr. 2006 May;136(5):1431S-1437S. Instituto Colombiano de Bienestar Familiar. Encuesta national de la situacion nutricional en Colombia, 2005. Bogota, Colombia. 2006. Holben DH, McClincy MC, Holcomb JP Jr, Dean KL, Walker CE. Food security status of households in Appalachian Ohio with children in Head Start. J Am Diet Assoc. 2004 Feb;104(2):238-41. Furness BW, Simon PA, Wold CM, Asarian-Anderson J. Prevalence and predictors of food insecurity among low-income households in Los Angeles County. Public Health Nutr. 2004 Sep;7(6):791-4. Kleinman RE, Murphy JM, Wieneke KM, Desmond MS, Schiff A, Gapinski JA. Use of a single-question screening tool to detect hunger in families attending a neighborhood health center. Ambul Pediatr. 2007 Jul-Aug;7(4):278-84. Rose D. Economic determinants and dietary consequences of food insecurity in the United States. J Nutr. 1999 Feb;129(2S Suppl):517S-520S. Review. Alvarado BE, Zunzunegui MV, Delisle H. Validation of food security and social support scales in an Afro-Colombian community: application on a prevalence study of nutritional status in children aged 6 to 18 months. Cad Saude Publica. 2005 May-Jun;21(3):724-36. Tingay RS, Tan CJ, Tan NC, Tang S, Teoh PF, Wong R, Gulliford MC. Food insecurity and low income in an English inner city. J Public Health Med. 2003 Jun;25(2):156-9. Zerafati Shoae N, Omidvar N, Ghazi-Tabatabaie M, Houshiar Rad A, Fallah H, Mehrabi Y. Is the adapted Radimer/Cornell questionnaire valid to measure food insecurity of urban households in Tehran, Iran? Public Health Nutr. 2007 Aug;10(8):855-61. Hackett M, Zubieta AC, Hernandez K, Melgar-Quinonez H. Food insecurity and household food supplies in rural Ecuador. Arch Latinoam Nutr. 2007 Mar;57(1):10-7. Kersey M, Geppert J, Cutts DB. Hunger in young children of Mexican immigrant families. Public Health Nutr. 2007 Apr;10(4):390-5. Weigel MM, Armijos RX, Hall YP, Ramirez Y, Orozco R. The household food insecurity and health outcomes of U.S.-Mexico border migrant and seasonal farmworkers. J Immigr Minor Health. 2007 Jul;9(3):157-69. Jones SJ, Frongillo EA. The modifying effects of Food Stamp Program participation on the relation between food insecurity and weight change in women. J Nutr. 2006 Apr;136(4):1091-4.